SAFE, ECO-FRIENDLY, AND UNBREAKABLE- These Silicone Wine Glasses are made of food grade silicone and are even foldable so you can stick in the dishwasher-YES, they are dishwasher safe! Also, besides the wine glasses included is a Bonus add on item Chrome diamond ring bottle stopper! 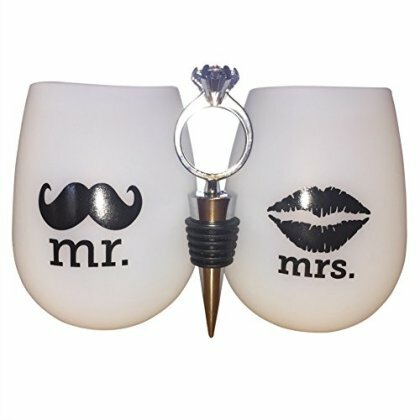 LETS HAVE A PARTY- You don't have to worry about breaking these silicone Mr. And Mrs. Wine glasses! So, get crazy and take these shatterproof, unique wine glasses along to any party, scenic hike, honeymoon, or just to simply enjoy at home! GREAT TO GIVE AS A GIFT- Buy this fun wedding package for a friends wedding, bridal shower, or birthday! This will be the most unusual and fun gift they will receive!